Montgomery County, Ala. – A Montgomery man has been found guilty of ambushing and shooting a man multiple times in retaliation for a previous altercation. 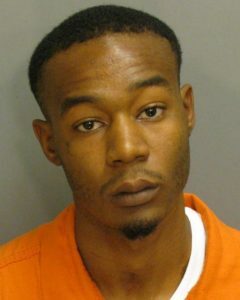 Eric Wendell Scott was convicted this week by a Montgomery County jury of the attempted murder of Jaquan Sanders. Scott, who faces 20 years to life in prison, will be sentenced Aug. 13, 2018, by Fifteenth Circuit Court Judge Truman Hobbs, Jr.
On Jan. 30, 2016, Scott called Sanders and asked him for a ride. When Sanders arrived on East 3rd Street around midnight to pick him up, Scott and another man were waiting for him. Gunfire erupted, and Sanders was hit twice in his back, twice in his arm, and once in his chest. He crashed his vehicle while attempting to leave the scene, and ran to a nearby Waffle House to seek help. Investigators were able to use Scott’s cellphone records to place him at the scene at the time of the shooting, which the investigation showed stemmed from an ongoing dispute between Scott and Sanders. District Attorney Daryl Bailey praised Deputy District Attorneys Ben Gibbons and Steven Chumbler for their outstanding work. He also expressed his appreciation to Chief Investigator Mike Thomas, Investigator Denny Merritt, and Detectives Guy Naquin and J.B. Roberson of the Montgomery Police Department for their work in the investigation of the case.